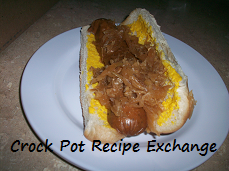 Line a 6 – 7 quart crock pot with a liner or aluminum foil. Stud the ham with the whole cloves, making sure to space them as evenly as possible. In a double boiler (which I make by using a heatproof glass bowl over a simmering pot of water) add honey, brown sugar and butter and melt until it all incorporates well when stirred. Evenly spread carrots on bottom of crock pot. Place ham in crock pot and baste it with glaze. Turn crock pot to high. Do not glaze again until crock pot is good and hot. This is important because you want the crock pot to come up to full temperature before removing the lid for basting the first time. You are now going to cook on high for 7 – 8 hours, basting every 25 – 30 minutes. Baste as quickly as possible and get the lid back on immediately. Also keep the glaze warm in the double boiler for the first 4 – 5 bastings. Make sure you cook to recommended temperature on packaging. If in doubt whether it’s done or not be sure to use a meat thermometer. When cooking is completed let ham rest for 20 minutes then slice and serve. Make sure it’s a crock pot recipe. I know you’ve done some great things with ham in the oven and on your stove top, but we want to see what you’ve done with ham in your crock pot. Link directly to your recipe, not your homepage. This will allow people to find your recipe for years to come. 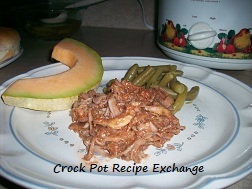 Make sure you mention that you shared your crock pot ham recipe here at Slow Cooking Saturdays Recipe Swap and link back to this post (just good blogger etiquette). We are all just trying to meet other crock pot lovers so HAVE FUN!